What are polyps and where do they come from? Our skull has some empty spaces above and under the eyes ( frontal and Maxillary sinuses respectively) , a collection of small sinuses between the eyes and the nose on both sides (ethmoid sinuses) and the sphenoid sinus at the back of the nose. 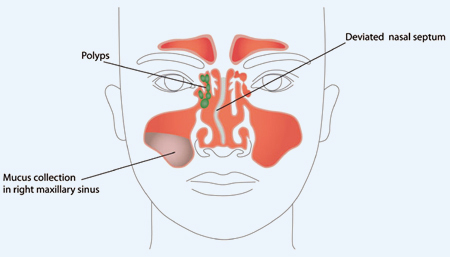 All these sinuses are lined by a membrance which can get inflamed either by an infection or allergy. At times, if this lining becomes so swollen up, as in the ethmoid sinus , it can break open the thin sinus wall and the lining would bulge into the space of the nostril. This bulge or bag like structure is called a polyp. If the polyps arise from the ethmoid sinuses like they normally do, they are multiple in number. If a polyp arises from the maxillary sinus it is usually a large polyp which comes into the nose and goes further back and tends to block the upper part of the throat (antrochoanal polyp). They can give a constant headache. The tear duct gets blocked at times causing watery eyes and itching in them as well. What symptoms do they produce? The polyps are usually on both sides of the nose but can be one sided as well. Due to their size and as they take up free space in the nostril, they block the nose, produce a lot of discharge and reduce the sense of smell. They can even breach the partition between the brain and the nose which causes the fluid around the brain to start leaking into the nose. However, this is not common. At times polyps can be seen at the opening of the nostrils, however a thorough ENT examination is mandatory. A nasal endoscopy is invaluable to the endoscopic surgeon. It shows the extent of the disease and helps the surgeon plan the future treatment of the patient. This is followed by another very useful test called the CT scan of the paranasal sinuses. If the polyps are very small, some surgeons will try oral steroids. This is not a medicine which can be used for a long period of time. So a decision has to be made in favor of surgery especially if the polyps have been there for along time, if there has been a recurrence of them or if the patient requests a quick relief. What surgical options are there? The older method of surgery was called an external ethmoidectomy, which invariably left a scar on the face. The best and the latest method of surgery is called “endoscopic sinus surgery” or “FESS” for short. What is functional endoscopic sinus surgery or FESS? This surgery is done under a general anesthetic and the patient usually only needs to stay in hospital for a day. Here a thin telescope is used ( see section on nasal endoscopy) to remove the polyps and clear the sinuses. The thin walls of the sinuses affected by the polyps are also removed and one big clean cavity is created in the nostril. This surgery should only be done by an experienced and trained endoscopic sinus surgeon in whose hands the complication rate is 1-3%. The relationship between the ENT doctor and the patient is a long term relationship if the allergy and the polyps are to be kept under control. No surgery can control the patients allergy ,so the doctor ‘s advise is very important regarding the control of the nasal symptoms and allergy if the polyp recurrence is to be kept under a check.